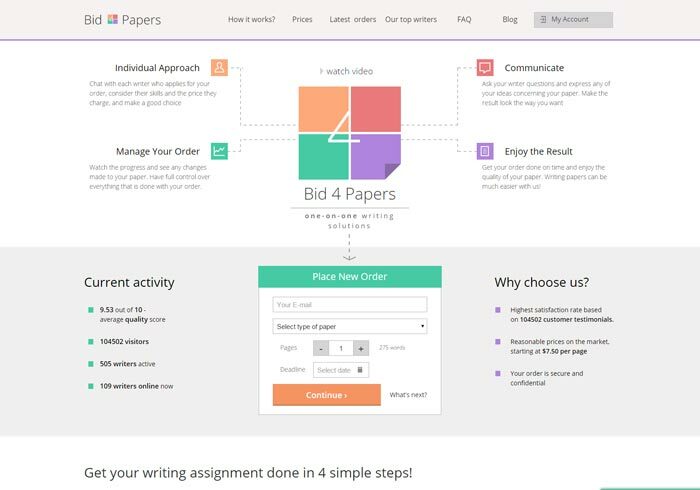 Bid4papers.com – Is an Essay Service Reliable? The web page of this essay writing company meets the user with a colorful design, and offers to place an order for the paper immediately. Many services offer the same instant approach for their client’s orders, and users might think this to be one of indicators of a good writing service. Actually, it can be so. But not in case if we deal with bid4papers.com. The review below is going to tell you more about the real possibilities of this company. For sure, you won’t be glad. This parameter is used for marketing purposes by every modern service, we all know that. Is the price itself really that affordable? Well, a doubtful plus is the fact, that there is a page with estimate quotes for some orders. “Affordable prices” are a bit higher than average ones on the market, but they are far from being the highest available as well. Not an advantage. And not enough to call them as a serous lack. Still, if you have got your budget strictly limited, it is better to consider other propositions. We can’t call costs indicated here as fair ones. Especially if to look at the quality of papers (described below). During our tests for this parameter, we had a constant controversial impression about it. During first few seconds of interaction, the design and user interface seem to be understandable, intuitive and clear. But the further you go, the more complicated it becomes. Lots of unnecessary notes, arrows and pop-ups don’t allow the user to concentrate on the main goal, and distract attention. In some words: if you are nervous about the interface, you won’t be glad to visit this website. Probably the most important feature that matters for every potential client who comes to an essay service webpage to place an order. Good paper quality can compensate all the lacks of a service, if only its authors do their job well. Do you agree? If to take into account the test task we ordered for this service, Bid4papers.com writers do not think so. Otherwise, they would not send us the paper filled with grammar mistakes in words and missing commas. Not a high-quality paper, not even good job. Just a bunch of words that somehow touch the wanted topic. 5 hours. 5 hours after the deadline. This was the time when we received the “completed order”. We didn’t notify managers about the deadline expiration on our own, but still, such fail is not a feature of a good online writing company. If your orders are mainly urgent – take a look onto other services. Bad. Very bad. Issues with interface usability can be fixed if to monitor user's opinions. If to consider prices wanted and to compare them with the final paper quality, this service simply can’t be called as “professional” and “affordable” one.